Youngstown, OH - It is with great sadness that we report that V. Rev. Stavrophor Janko Rajlich passed away in the Lord on Saturday, April 27, 2012. Prota Janko was a long time parish priest of Holy Trinity Serbian Orthodox Church in Youngstown, Ohio. For many years he served in the capacity of Dean of the Cleveland Deanery. Burial to follow the liturgy. VERY REVEREND STAVROFOR JANKO RAJLICH YOUNGSTOWN – The Very Reverend Stavrofor Janko Rajlich, 74, fell asleep in the Lord on April 28, 2012, in Youngstown. He was born in Stari Majdan, Republic of Srpska (Bosnia and Herzegovina), a son of the late Milan and Jelena (Vuckovic) Rajlich. He was the husband of the late Protinica Srbobranka Rajlich, whom he married on Nov. 1, 1959. He was the father of Alexandra Debelnogich (Goran) of Macedonia; grandfather of Jelena and Stefan; and brother of Dragan Bilbija, Milica Miljus, Dusanka Kosojevic and the late Borislav Bilbija. He was the parish priest of the Holy Trinity Serbian Orthodox Church in Youngstown and Dean of the Cleveland Deanery. 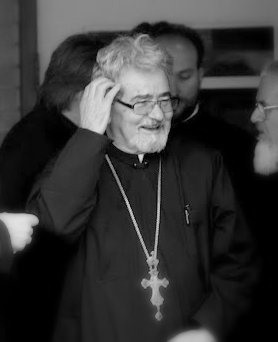 He was a member of the Ecclesiastical Court, and the Diocesan Council of the Diocese of Eastern America of the Serbian Orthodox Church. Calling hours for Fr. “John” Rajlich will be held on Monday, from 5 to 8 p.m. at the Holy Trinity Serbian Orthodox Church, with a Pomen (prayer service) at 7 p.m. at 39 Laird St. in Youngstown. The funeral will be on Tuesday, May 1, at 10 a.m. at the Holy Trinity Serbian Orthodox Church, 39 Laird St. in Youngstown. Funeral arrangements have been entrusted to the care of the Vaschak-Kirila Funeral Home. Please visit www.vaschak-kirilafh.com to view this obituary or to send condolences to the family. Memory Eternal – Vjecnaja Pamjat.